Marlie and Me: Score the Best Fashion Discounts at Modnique! 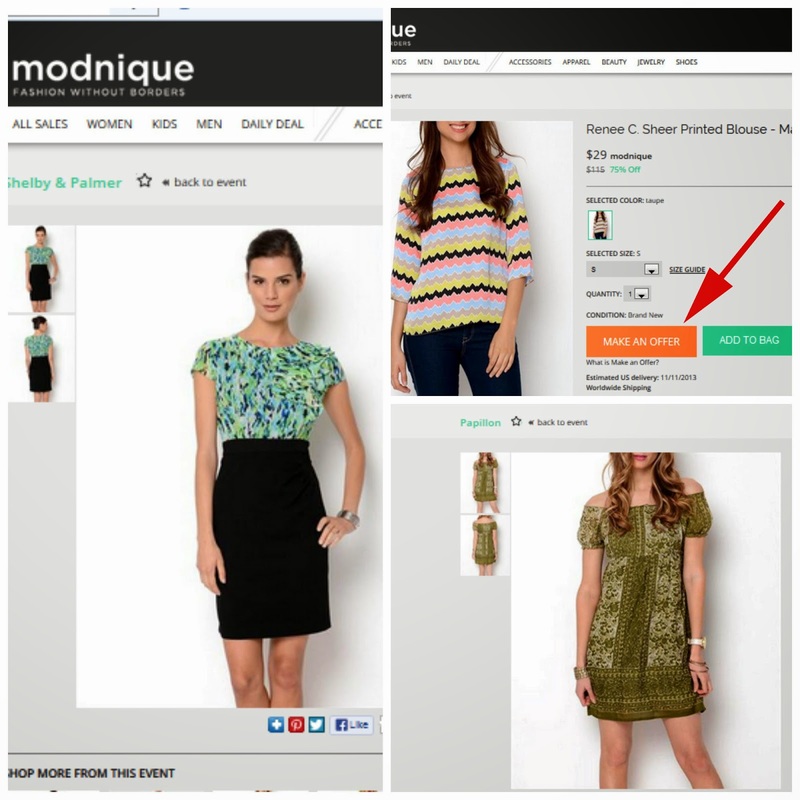 Modnique.com is like no other discount fashion retail site. First off, it is HUGE! There are thousands of deals for the taking. I am not exaggerating when I say you will get lost in this site. This is what I saw when I landed on the homepage...dresses, earrings, and boots oh my! When I became a mom I lost my fashion sense along with half my brain cells. But now I am in fashion recovery. I have been having a ton of fun lately rediscovering my personal style while shopping online. I call my new style mom chic, sensible clothing accentuated with fancy accessories like statement jewelry and bold print scarves. 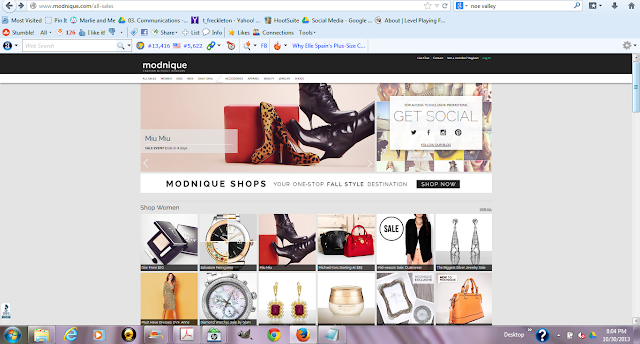 I like shopping online for the convenience, variety and deals so I gladly took Modnique.com up on their offer to shop their site. Modnique lives up to their tag line, "fashion without borders" because they really go above and beyond handpicking designer brands at clearance prices. They have have everything for the whole family from Accessories to Zapatillas, as well as beauty products and home goods. Everything is brand name and on trend. If you are looking for luxury brands they got you covered. Up to 48% off of Tiffany and Co...?! It's like having a premium outlet mall at your fingertips! One thing I truly appreciate about Modnique.com (besides the knock-your-socks-off prices) is how well the site is organized. Each limited-time sale can be sorted by brand, size, color and price to help you narrow down your search and add to your cart even faster. 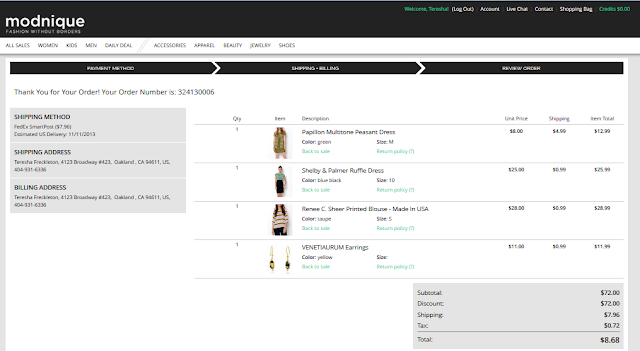 It is a cinch to shop the retail section too because each category (Accessories, Apparel, Beauty, Jewelry, Shoes) is sorted by designer and then you can filter items by gender, style, size, and color. I would like to see a search box and a better scrolling bar to make site navigation even easier. There is also a daily deal that you must see to believe. 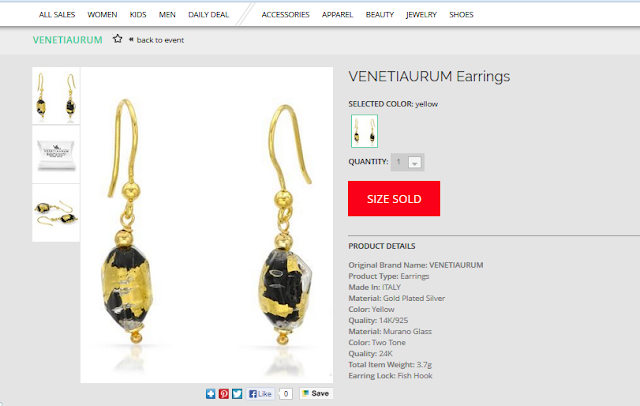 I snapped up this pair of VENETIAURUM 24K gold plated silver two-toned Murano glass earrings valued $160 for $11! Here is what else I scored at Modnique.com. A gorgeous Shelby and Palmer Ruffle Dress perfect for work at 68% off. A cute Renee C. Sheer Printed Blouse great for Casual Fridays at 75% off. And a Papillon Multitone Peasant Dress to wear next spring/summer at 83% off. You see that "Make an Offer" Button? I used this to save another dollar on the blouse! You need to head over to Modnique and take advantage of their incredible savings for fashion mavens! Their 20 Days of Deals kicks off on November 7th. You can keep track of each day’s deal by either visiting Modnique, the Modnique blog, or the Modnique Facebook Page. Mark your calendar so you don't miss it! I feel like I have visited the site through your eyes. Sounds exciting, especially that make an offer button. What cute and fun pieces they have! 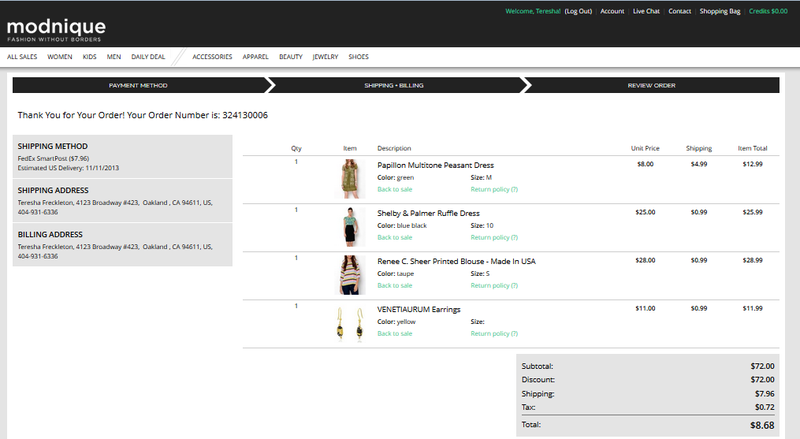 I am loving the prices and those handbags! I think it's neat Modnique has themed discount days to help cater to trends and specific wardrobes. I hate to pay full price so it's always great to know about another site where I can find bargains. i love Modnique! they have great stuff! I never heard of them before but they really have great stuff! Oh I just love their fashion designs! I could get lost in that site for a long time too! I've purchased from Modnique before and was very pleased with my order. I had no idea they have a best offer option...that makes it even better!